How do I make a sub-domain application SSL? I need an answer IMMEDIATELY. We have changed the URL of our application to apply-online.truckersamerica.com/#####whatever, but with the Wildcard SSL active it is still not secure. How do we set this up? I am sorry to inform you, but custom domain option will show the certificate error on the httpS connection due to not matching host name. - Use simple SSL URL (e.g. 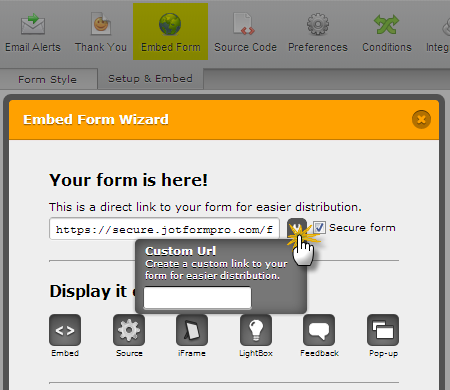 'https://secure.jotform.com/form/form_id'). - Use custom name with SSL. - Get JotForm Licensed App and install it on your own server with SSL certificate on the domain. So we cannot have the custom domain along with the SSL? You can use your custom domain with the SSL, but this will show the certificate error in the browser. Unfortunately, there is no easy way to remove that error. There's no EASY way, but is there a way to remove the error and still have the custom domain? I note your site has its own SSL cert, can you not just embed the form using an SSL URL the more conventially way on a page on your website?